In the early nineteen-fifties, several of the Masonic Fraternity of Hebburn, primarily from our mother lodge, Perseverance Lodge No. 1643, considered that in order to fulfill a need which undoubtedly existed in the area, they would petition United Grand Lodge for a Warrant to form a new Lodge. This need was a very real one for despite Ellison Hall Lodge being similarly warranted in the March 1952, a warrant was granted on the 4th June, 1952 to Heabrym Lodge. The founders, whose names are listed in the Festival Menu, decided that the new lodge would carry the name Heabrym. 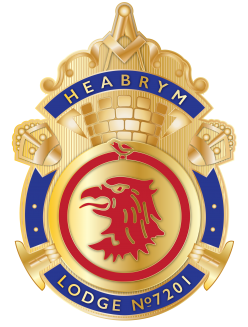 This was a very astute choice on their part as it immediately bestowed a history to the new lodge, the word Heabrym being the ancient name for Hebburn and the earliest documented reference to it being as early as 1104. The name is derived from two Anglo-Saxon words both with Masonic connotations, ‘HEAH’ meaning ‘HIGH’ and ‘BRYM’ or ‘BRYMME’ meaning ‘SEA’ or ‘SHORE’ and of course the Masonic significance of these terms is made abundantly clear to all initiates in the obligation. The brother entrusted with the initial guidance of the yet embryonic lodge had obviously to be a Freemason of high standing and fine judgment. This was achieved by the election of W.Bro. Ernest Younson P.P.G.D. to be the first Master. W.Bro. Younson had been the Master of Perseverance Lodge in 1940 and his experience and great influence were to be felt by Heabrym Lodge until his untimely death in 1973. Of course experience is a rare and valuable commodity and the lodge has been blessed with more than its share during the last 25 years but never more than at its inception. Its first year officers and founders counted many eminent brethren among its numbers, not least of who was the late W.Bro. Joseph Kirkham, whose Masonic achievements in themselves were legion. Also on the initial list of officers was our Past Master W.Bro. Donald Ketchen, who was destined to become the first Master Mason to be installed in the Chair of the lodge. Others present at that first meeting night that are immediately recognizable to present brethren of the lodge include Bro’s T. Colquhoun and W. Holtham. A formidable catalogue indeed of Masonic knowledge. The consecration of the lodge took place in this Temple on 18th October, 1952 with the consecration officer being the R.W. Provincial Grand Master, R.W. Brother R.W. Ernest Dixon accompanied by nine Grand and Provincial Grand Lodge Officers. After the consecration ceremony, Bro. Younson was installed into the chair of King Solomon as the first Master of the lodge and then went on to invest his officers with due ceremony. Five proposal forms for initiation were read out at that first meeting indicating a healthy future for the new lodge and a promise of growth. The promise has been fulfilled and extended during the intervening 25 years. Among the first five names for initiation was that of our present organist Bro. John Dutton who has recently and very deservedly been honored with provincial recognition. The first of HEABRYM initiates to become Master of the lodge was W.Bro. T.R. Cook, who was initiated in February 1953 and attained the Master’s Chair in November 1962, He was subsequently awarded the rank of P.P.Asst.G.Reg. in June1968. Heabrym Lodge continued to grow in strength and in 1962 the first Provincial honour was bestowed when W.Bro. Donald Ketchen was invested as P.P.G.W. together with W.Bro. Kirkham who was further honoured with the Rank of P.P.G.W. W.Bro. Kirkham went on to be invested with Grand Rank being awarded the collar of P.Asst.G.D.C.